The comforting world of premium cigars can sometimes seem bogged down by endless choices, confusing messages and opinions posing as fact. It can be a complicated, confusing hobby, even for a longtime smoker. To help navigate the maze, we’ve assembled a list of facts and information that aim to give insight and perspective to every level of cigar aficionado, whether novice or inveterate. This list is by no means a Ten Commandments of cigar smoking. It’s more of a basic treatise that addresses pertinent issues and highlights some of the aspects that make the premium cigar industry unique. We’ve also included a few useful tips that will serve to enhance the smoking experience and elevate the enjoyment of this beloved pastime. 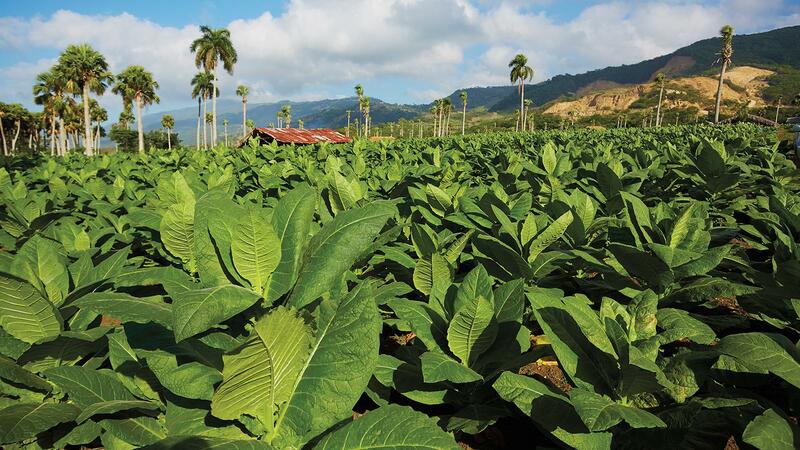 A field of sun-grown tobacco flourishes in a valley in the Dominican Republic. The crops grow from natural fertilizer. Buzzwords like “natural” and “artisanal” are overused and abused in today’s parlance, but premium, handmade cigars have truly earned the right to flaunt these credentials. They are made of one thing and one thing only—tobacco. Pure, unadulterated tobacco. Not a single leaf is chemically treated or artificially altered for taste. Everything from flavor to color is achieved through natural means—and that’s part of the cigar’s inherent beauty. In fact, few consumable products are so natural. Perceptible flavors, whether sweet or spicy, are naturally occurring. The various alluring shades of brown are achieved through an organic process free of dyes or ripening accelerants. There are no preservatives to increase shelf life and no sweeteners, artificial or natural. Such additives and chemicals are the domain of cigarettes and machine-made cigars, which are mass-produced in the billions. On the craft side, rolling the perfect handmade cigar is an artisanal skill, and one that takes many years to fully master. Blending tobacco is as much art as it is science, and because tobacco is subject to the whims of nature, the blender must be able to work effectively with an ingredient that can change from year to year due to crop variations. Like wine, some vintages are better than others, but cigarmakers will do everything in their power to ensure that their product is consistent, even though crop quality is highly dependent on the weather. Consistency, however, isn’t the same thing as cloning, and there will always be minute variations from cigar to cigar. As with any handmade product, no two premium cigars will be exactly alike. The finest, most sincere cigars are natural expressions of both the cigarmaker and the soil from which the tobacco was grown. It’s often said that 200 pairs of hands touch your cigar before it makes it to your humidor. Some claim the number is even higher. Suffice to say, every time you light up a cigar, many, many people with many different skills all contributed to bring you the ultimate handmade product. It starts with seed selection and greenhouse cultivation. Cigar tobacco starts as a tiny seed, most often planted in a tray and grown in a greenhouse. Once the seedlings are a few inches high, they’re transplanted to the fields where they can flourish. At full height and maturity, the leaves are removed by hand, harvested and hung in a curing barn to dry and turn brown. That’s a few dozen hands before the tobacco has even left the farm. The cured tobacco is then taken to a facility, unpacked and piled up for fermentation. When fermentation is complete, the tobacco pile is separated and laid on drying racks to air out. Then, it’s all repacked and stowed for aging. After a few years, the aged tobacco is unpacked again, rehydrated in a special misting room and categorized for color. That’s a few more dozen hands. The outer wrapper leaves will also undergo destemming or despalillo, a process where the thick, central vein is removed from the leaf. Sometimes that step is done completely by hand, other times the tobacco is fed through a stripping machine. For filler, a worker will remove part of the stem by hand, leaving the rest intact. More hands. Don’t forget the rolling process, which requires appointed factory workers to dole out the proper proportions of aged tobacco to the rollers each day. The torcedor takes his pile of leaves back to his rolling table and recreates the cigar according to the cigarmaker’s blend, bunching and rolling each cigar by hand. The blend is formulated of exacting proportions of very specific tobaccos to impart a very particular smoking experience—a formulation that puts more hands on your cigars. Finished cigars are sorted for color consistency, then sent to the aging room. Finally, they’re banded up, boxed and sent out. This is the basic chronology of how a cigar is made. There are, of course, plenty of other quality-control steps that vary from operation to operation, and nearly all are completed entirely by hand, but the point is this: a single hand-rolled cigar is a massive human effort that requires hands-on expertise on every level. Tobacco arranged in enormous piles (pilónes) for fermentation. The combination of pressure, water and naturally occurring heat will rid the tobacco of undesirable properties like bitterness. Fermentation is common to producers of wine and spirits, defined as a process that converts sugars in organic material to alcohol, often with the use of yeast. In the tobacco industry, it’s more of a microbial fermentation—one that breaks down the leaf organically through the use of water, pressure and oxygen. No alcohol is produced in tobacco fermentation, but the process releases heat as it changes the chemical composition and physical traits of the leaf through humidity and oxidization. Tobacco undergoes fermentation for one simple reason: it makes the tobacco taste better. The process affects the flavor and smell of tobacco, making it less astringent and reducing bitterness while bringing out its more floral, nutty and sweeter aspects. Fermentation is fairly simple. 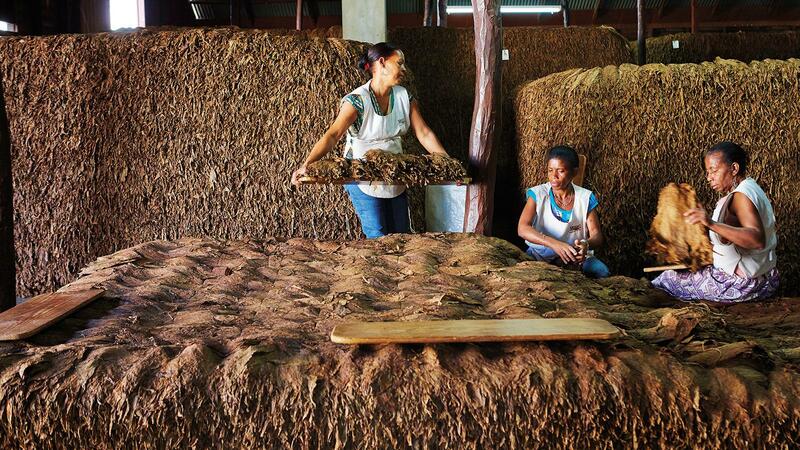 Once tobacco has been cured in a barn, the leaves are arranged in large piles known as pilónes. The only thing added is water. The weight of the piles produce pressure while the enzymatic and microbial breakdown produces the heat. The piles are checked daily and the temperature is monitored. When the internal temperature of these pilónes reaches a certain point, the tobacco pile is taken apart, rotated by hand and painstakingly reassembled. Ideally, tobacco is piled and fermented according to size and type. Different-sized leaves and different tobacco varietals will ferment at different rates, so the pile must be as homogenous as possible. The idea is to naturally alter the taste of the tobacco and transform it from its raw, bitter state to something smokeable and pleasant. Underfermented tobacco will often have a harsh aftertaste and smell like ammonia. It’s not a process that can be skipped or rushed and is critical in the world of premium cigars. Aging tobacco plays a vital role, both before and after the cigar is made. Not only is the fresh leaf aged before it’s rolled into a cigar, but a newly completed cigar in most cases is then sent to an aging room where the tobaccos marry and the humidity levels of the cigar can stabilize. Tobacco leaves are aged after fermentation. During aging, the leaves are packed up into tight parcels called bales where they undergo a slow, steady breakdown of carotenoids, which helps to bring out the desirable properties in the tobacco. The aging also lends a bit of polish and maturity, helping to rid the tobacco of vegetal or “green” notes. Ever smoke tobacco that tastes like freshly cut grass or raw green beans? That tobacco has not been fully aged. If the cigar smoke is more redolent of almond, raisin and orange blossom, it has been aged properly. But there’s a tertiary aging, and that’s done by the consumer. Once the cigar is boxed up and sent to the shops, a consumer may wish to age the cigars even longer. Similar to aging wine, this process helps to further dissipate any acidity in the tobacco and allows its mellower more nuanced personality to come through. Perfect aging is achieved when you bring a cigar to its absolute peak of flavor. At peak, flavors are not only at their most balanced and cohesive, but all undesirable qualities such as bitterness or harshness are completely absent. A great cigar can age for decades so long as the temperature and humidity are stable throughout. There are some caveats. Don’t over-age the cigar. Over-aging can result in loss of flavor and body, making the cigar taste flat and dusty. Another thing to know: aging a bad, sour cigar won’t make it any better. It will just make it bitter and old. The anatomy of a cigar is made up of its wrapper, binder and filler. A cigar is made up of three major parts: wrapper, binder and filler. The three form a smoking system and the single system forms a singular organism called the cigar. The wrapper is the visible outer cover leaf. It’s also the most expensive component per pound, as these tobacco leaves need to be pristine in appearance, as well as flavorful. If the leaf is too veiny, rough in texture or has any blemishes, it’s no longer categorized as wrapper. The binder can be considered a wrapper leaf that didn’t make the cut. It’s often the same tobacco as the wrapper, only not as smooth in appearance, and it doesn’t have to be—you don’t see it. 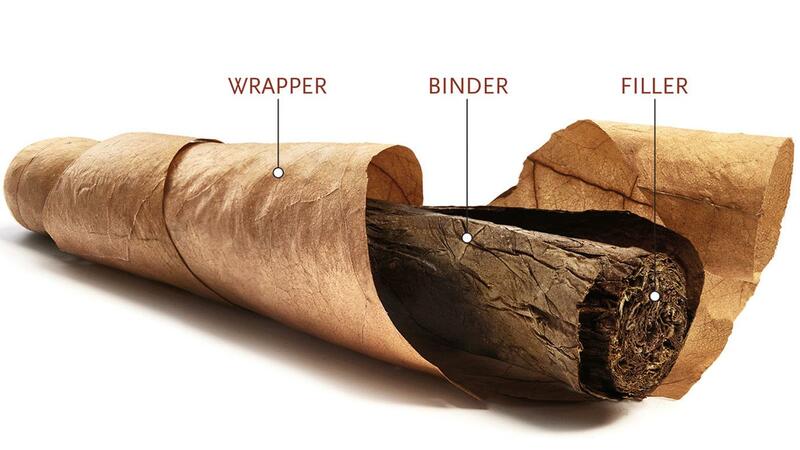 Binder is the leaf of tobacco directly underneath the wrapper and holds the filler tobacco in place, hence the name. Combustion of the binder is critical, as a good-burning binder will often help the filler to burn more evenly, especially if the filler contains more oily tobaccos that do not burn easily. The filler is where the cigarmaker can be most creative, as he can use several different types of tobacco from various countries and several different primings of tobacco for desired flavor, strength and complexity. As with the wrapper and binder, these are long-filler tobaccos that are put into place to burn slowly yet offer a fine gustatory and aromatic experience. In the case of torpedoes and piramides, which taper drastically to a point, you shouldn’t cut off so much of the head that you actually lose the taper. It’s there for both functional and aesthetic reasons—to fit more comfortably in your mouth and to look nice. They are harder to make and require the work of a highly skilled roller. Also, they take longer to create, which is why they are generally more expensive. Cutting off too much defeats the entire purpose, both practically and artistically. Conversely, not cutting off enough can result in a firm draw and a build-up of tar in the head that will ooze into your mouth, something any sane smoker wishes to avoid. But it’s better to cut too little than too much—you can always cut more. The risk is even greater with powerful torch lighters, which burn at a much higher temperature than soft, natural flames. While we certainly appreciate the wind resistance and surgical control of a torch flame, you’re goal is lighting a cigar, not welding pipes. Some cigar smokers puff too often. This is a mistake for a few reasons. Philosophically, a cigar is about enjoyment and savoring the moment. Smoking fast runs counterintuitive to this sentiment. Take your time and slow down. But there’s a more concrete reason as well. Hyper-frequent puffing will inevitably overheat your cigar and cause it to become bitter. Often, that bitterness is irreversible. A perfectly constructed cigar is made to burn slow and cool in order to impart flavor in a steady progression. While there are no set laws as to how long a cigar should last, we believe that a five-inch cigar should last you at least 45 minutes. If you’re sucking down a five-inch robusto in 10 minutes, you’re treating the cigar like a cigarette, and that’s a big mistake. Puffing every 30 seconds to a minute should be an appropriate interval. Keep in mind that smoking too slowly could have a negative consequence as well. Puff too infrequently, and your cigar will go out, meaning you’ll have to relight it over and over again. Constantly lighting an extinguished cigar could introduce unpleasant flavors of char, carbon, sulfuric fumes and bitterness. But don’t sweat a relight now and then. Leave the ash on for as long as you can. The ash serves as a temperature regulator and minimizes contact between the air and the lit tobacco, thus keeping it cooler. Great cigars are made of whole leaves, not chopped up tobacco. Those leaves have structure, and will hold an ash of a size that’s surprising to a novice. The cigar choices in a well-stocked retail humidor can be overwhelming. A little bit of knowledge about the blend and strength can go a long way. It’s important to know something about the blend before choosing a cigar. This helps to ensure you don’t choose a smoke that’s too strong or too mild. You don’t have to know every last tobacco component of the cigar to make an informed choice, but you should always have a basic idea of the cigar’s strength level before you buy it. Most smokers know if they want a strong, medium or mild cigar. Strength and body refer to the cigar’s inherent intensity. One could smoke a cigar that is full of flavor, yet not particularly strong or full-bodied, meaning there’s still plenty of finessed flavor that won’t impact the palate too heavily. Sometimes, smokers want full, intense palate stimulation along with heavy flavors, much the way a coffee drinker wants a strong shot of espresso or a wine drinker wants a high-alcohol cabernet. That requires powerful tobaccos. Typically, a full-bodied, powerful cigar will contain ligero tobacco. These are the darkest, thickest leaves of the tobacco plant as well as the most oily and rich on account of their direct exposure to the sun. Leaves tend to get less powerful as they grow lower down the stalk of the plant. Categorized as visos and secos, these lower-priming tobaccos are more nuanced in flavor and have better combustion. A full-bodied blend will contain more ligeros, a medium-bodied blend, more secos and visos. You can’t always tell, however just by looking at the cigar. Dark, oily wrappers often indicate a strong smoke the way light wrappers often indicate a mild or medium-bodied smoke, however looks can sometimes be deceiving. Our ratings will point you in the right direction. Also, beware the “sangria effect.” That happens when the cigar’s strength sneaks up on you. You think it’s a mild or medium-bodied cigar based on the easygoing flavors, but then when you try to stand up, you realize you can’t. As long as people smoke premium cigars, there will always be the proud debate as to which cigars are the best, and the argument usually boils down to Cuban cigars vs. non-Cuban cigars. Lifelong Habanophiles will always preach “inimitable Cuban taste” while more universal cigar fans retort “Cubans are overrated.” It is this magazine’s opinion that Cuban cigars are great, but they are not alone in their greatness. The best Nicaraguan, Dominican and Honduran cigars can compete on the quality level with the finest Cubans. 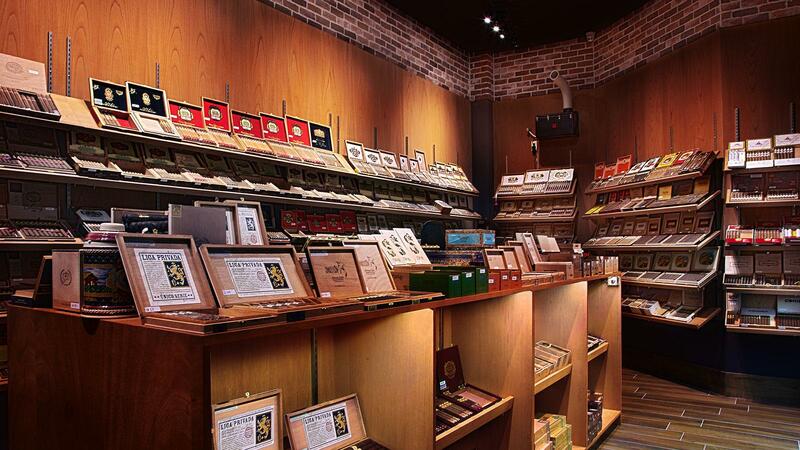 The top-tier smokes of the major cigar-producing nations are all outstanding in their own way. They are true agricultural and artisanal expressions of their respective countries. This is evident in our tasting sections and in our Top 25 Cigar of the Year awards. Sometimes a Cuban cigar wins, sometimes it doesn’t, as in our most recent Top 25, which was won by a Dominican cigar. Price isn’t always an indicator of quality. A cigar that costs $30 won’t always be more enjoyable than a cigar that costs $10. Inexpensive cigars sometimes score better than pricey ones in our blind tastings. At the same time, it’s important to understand that the best materials, finest construction and most acute quality control will cost money. As is true with all raw materials, not all tobacco is of equal quality. Some crops are better than others. You might have heard (or read) a few rather ignorant maxims like “tobacco’s tobacco” or “all tobacco is basically the same.” Statements like that are uninformed, and they presuppose that different levels of quality do not exist. Nothing could be further from the truth. Standards of quality are determined by appearance, combustion, aroma and flavor. A highly aromatic, flavorful tobacco that is pristine in appearance and elastic to the touch is going to be more expensive than a coarse leaf that doesn’t have much smell or taste. Some tobaccos also take longer time to age and ferment for maximum performance. That process will also end up raising the cost of your cigar—the longer the cycles, the longer the tobacco has to be stored in a warehouse, and that costs money. The tobacco could be a low-yielding varietal, meaning that the crop was not large in the field, yet the small amounts produced were outstanding. This could also make your puros a little pricier. Sometimes it’s merely a question of supply and demand. Occasionally, a cigar is expensive for arbitrary or gimmicky reasons that have nothing to do with quality or availability. Those unfortunate exceptions are not normal in the premium cigar industry. If a cigar is expensive, the cost is usually justified. That being said, there’s no guarantee you’re going to love the expensive cigar. The flavor profile and strength level (either high or low) of a high-end smoke might not be to your taste. The best way to know is to try it. If you spend the extra money and find that the experience doesn’t justify the cost, then stay within your comfortable price range. If you find extraordinary levels of flavor, refinement and complexity, you’ll know the cigar was worth the splurge.